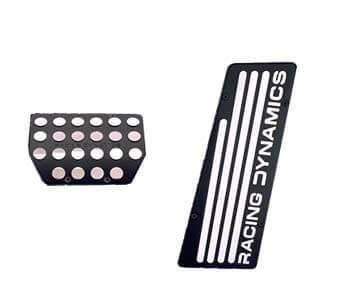 Racing Dynamics competition sport pedal set, fit most BMW's with manual & M3/M5/M6 with/ SMG transmissions; 3-pc billet. The RD pedal set is engineered to offer better control and improved heel and toe shifting. 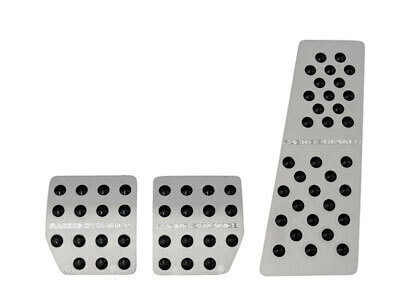 These billet aluminum pedals are manufactured with a rubber tread surface pattern for improved grip under hard driving conditions and are a very distinctive addition to the interior of your BMW. Pedals mount without drilling through a unique system of brackets. All pedals are embossed with a full RACING DYNAMICS logo. Does not fit non-M cars with SMG transmission, please see automatic pedal set. Does not fit E90/E91/E92/E93 3-series manual. Competition pedal set fits all MINI Cooper models with automatic transmission; 2-pc. The RD pedal set is engineered to offer better control. This billet aluminum set of pedals are manufactured with a special surface pattern for improved grip under hard driving conditions and are a very distinctive addition to the interior of your MINI. Pedals mount without drilling through a unique system of brackets. The gas pedal is embossed with a full RACING DYNAMICS logo. Sport pedal set with rubber pads fit Manual Porsche 911 (996/997) and Boxster/Cayman (986/987) models. Pedals have rubber non slip points for secure feel during adverse conditions. Set includes four pedals, Brake, clutch and gas plus footrest. Design was developed in European for better grip during sport driving events. Billet aluminum, CNC machined with rubber pad underneath so rubber protrusions extend through the aluminum, contacting the drivers shoe for a more secure grip. Comes complete with hardware for mounting to original pedals. Photograph shows complete set, dead pedal, brake, clutch and gas pedals. The use of BMW, MINI, & Porsche are for applications only. BMW, MINI and Porsche are registered trademarks of their respective owners.